Every so often a film comes along which seems to launch most of the cast into various levels of stardom. 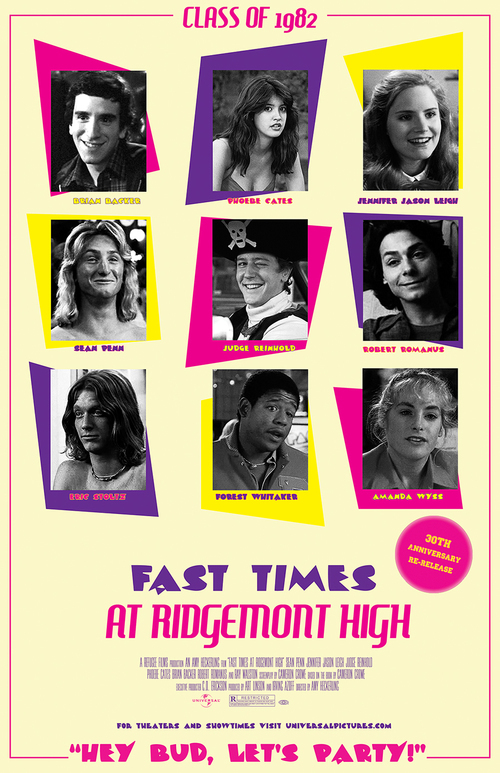 1982’s Fast Times at Ridgemont High is one of those movies. Amy Heckerling directed Cameron Crowe’s script of life in a California high school. While Sean Penn may have been the breakout star of the movie for his stoner Spicoli, he was hardly the only actor to make a mark with it. Judge Reinhold, Jennifer Jason Leigh, and Phoebe Cates all saw their profiles rise due to this film. Nicolas Cage, Eric Stoltz, Anthony Edwards and Forrest Whitaker, though in minor roles, also appear in the movie. Others in the cast included Tony Award winners Ray Walston and Brian Backer, Robert Romanus, Scott Thomson, Vincent Schiavelli, Amanda Wyss, D. W. Brown, Taylor Negron and Nancy Wilson (Mrs. Cameron Crowe). Episodic in nature, this film celebrates and commiserates the challenges of life in high school. It examines classes, dating, and bad jobs. 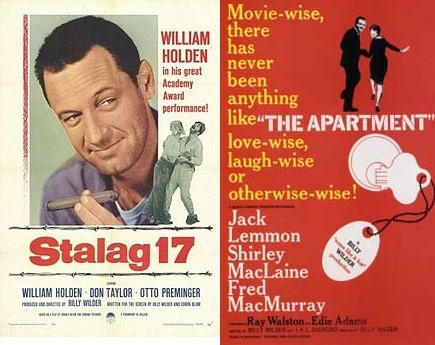 Today’s Christmas movies take a darkly comic turn with Billy Wilder’s Stalag 17 and The Apartment. William Holden won an Oscar for his heroic-anti-hero Sefton in 1953’s Stalag 17. Set in a German POW camp during World War II, it tells the story of a group of Americans who share a barracks. Holden’s character is a black market profiteer who is disliked by most of his fellow prisoners. Otto Preminger plays the iron-fisted commandant of the stalag. Robert Strauss, Harvey Lembeck, Don Taylor, Richard Erdman, Neville Brand, Gil Stratton and Robert Shawley play other residents of the barracks. Wilder’s movie was based on a play written by Donald Bevan and Edmund Trzcinski. The two playwrights had actually spent time in a Stalag during WWII. The latter also had a bit part in the movie. Once “Hogan’s Heroes” started airing on TV, the makers of Stalag 17 sued for plagiarism since they had pitched it as a TV series in the 1960s. The case was settled out of court. Stalag 17 is a layered story with much humor in such a depressing setting. It is also a mystery as the barracks residents seek to determine who is sharing their secrets. Wilder would return to Christmas Eve and a different type of hero in 1960’s The Apartment. Jack Lemmon plays a rising corporate executive who tries to succeed by letting his superiors use his apartment for their assignations. Complications arise when he falls in love with Shirley MacLaine, who is involved with his boss played by Fred MacMurray. Others in the cast include Hope Holiday as a barfly who meets Lemmon in a bar on Christmas Eve, Ray Walston, Edie Adams, Jack Kruschen and David Lewis. David White, better known as Larry Tate on “Bewitched,” plays a less honorable businessman in this movie. This is definitely an adult comedy. It subtly shifts between comedy and drama. Like Stalag 17, Wilder chose to shoot this movie in black and white to add to its mood. These films serve as reminders that in the 1950s and early 1960s, the choice of filmstock really lent a tone to the movie. The chemistry between Lemmon and MacLaine is palpable. They both play lovable losers that the audience wants to root for. MacMurray, who had starred in Wilder’s Double Indemnity, is unafraid to play an unlikable character. Interestingly he was just starting his run in “My Three Sons” when this film came out. The Apartment won five Oscars: Best Picture, Best Director (Wilder), Best Original Screenplay (Wilder and I.A.L. Diamond), Black & White Art Direction and Film Editing. It was also nominated for five other Oscars including Lemmon (Actor), MacLaine (Actress) and Kruschen (Supporting Actor). Billy Wilder was a genius of a filmmaker. These two films are testaments to that fact.